Although some genealogies for the Pahlavi family have been produced, which go back to the seventeenth century, these are difficult to verify or credit. The earliest verifiable ancestor was Captain Morad Ali Khan. His grandson, Reza Khan was brought to power in a coup d’in 1921. The Qajar dynasty was ousted and Reza Khan proclaimed as Shahanshah by the Persian Majlis in 1925. The name of the country was altered to Iran (Land of the Aryans) in 1935. His son and successor, Muhammad Reza Shah, was forced into self-imposed exile by the Islamic revolution in 1979, Iran was proclaimed an Islamic Republic and the monarchy was abolished. The Sovereign: Ala Hazrat Shahanshah-i-Iran, Aryamehr, i.e. King of Kings of Iran, Light of the Aryans, with the style of His Imperial Majesty. The Consort of the Sovereign: Shahbanu, i.e. Empress, with the style of Her Imperial Majesty*. The Heir Apparent: Vala Hazrat Vali Adh, i.e. Crown Prince, with the style of His Imperial Highness. Younger sons of the sovereign: Vala Hazrat Shahpur (personal name) Pahlavi, i.e. Prince, with the style of His Imperial Highness. Daughters of the sovereign: Vala Hazrat Shahdokht (personal name), i.e. Princess, with the style of Her Imperial Highness. Grandsons and other descendants of a sovereign in the male line, grandsons of a sovereign in the female line and their male-line descendants: Vala Gohar (personal name) (father’s surname), i.e. Prince, with the style of His Highness. Grand-daughters and other female descendants of a sovereign in the male line, grand-daughters of a sovereign in the female line and their female descendants in the male line: Vala Gohari (personal name) (father’s surname), i.e. Princess, with the style of Her Highness. * the title of Shahbanu was devised especially for Empress Farah at the Coronation of 1967. A similar Imperial style being devised at that time for the Shah’s mother. Prior to that date the wives of the Shah were styled Malika (Queen), with the style of Her Majesty. The Shah must profess the Islamic (Shi’ite) faith, and his mother must be an Iranian citizen, a Muslim and not descended from the previous Qajar dynasty. See separate page on ORDERS & DECORATIONS - link below. Aryamehr: Light of the Aryans, a title adopted by the Shahanshah in 1967. Hazrat Vala: His Royal Highness. Iran: Land of the Aryans. 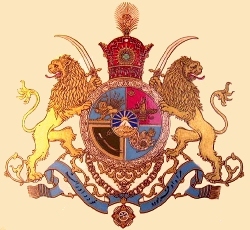 Pahlavi: family name adopted by Reza Shah, the word designated the official language and writing during the Sasanid Empire. Shahdokht: ‘King’s daughter’, the title of a Princess of the Pahlavi dynasty. Shahpur: ‘King’s son’, the title of a Prince of the Pahlavi dynasty. Shahanshah: ‘King of Kings’, i.e. Emperor. Shahbanu: ‘Lady of the Shah’, i.e. Empress. Vala Gohar: the style borne by the sons of a Princess of the Pahlavi dynasty, translated as Prince with the style of His Highness. Vala Gohari: the style borne by the daughters of a Princess of the Pahlavi dynasty, translated as Princess with the style of Her Highness. Vala Hazrat: His Imperial Highness. Vali Adh: Heir Apparent, the title of the Crown Prince of the Pahlavi dynasty. Claude Brezinski, Dominique Tournès. André-Louis Cholesky: Mathematician, Topographer and Army Officer. Springer International Publishing, Switzerland, 2014. Burke’s Royal Families of the World, Volumne II: Africa & The Middle East. Burke’s Peerage Ltd., London 1980. Cyrus Ghani. Iran and the Rise of Reza Shah: From Qajar Collapse to Pahlavi Rule. I B Tauris & Co Ltd., 1998. Divorce Papers of HIH Princess Hamdan us-Sultana. Iranian Institute of Contemporary Historical Studies. http://www.iichs.org/index. Downloaded 12/01/2016. Iran Almanach and Book of Facts, Tehran, 1967. Robert L. Jarman (ed). Iran Political Diaries 1881-1965. 14 volumes. Archive Editions, Archive International Group, Melksham, Oxon., 1997. Earnest R. Oney (editor). Elites and the Distribution of Power in Iran. (Secret). Directorate of Intelligence, Office of Political Research, Central Intelligence Agency, February 1976. Published by https://archive.org/ Downloaded 31/01/2016. Adel Sabit and Dr Maged Farag. 1939, The Imperial Wedding (Royal Albums of Egypt). Max Group, AMS, Cairo, 1993. Who’s Who, and Leading Personalities in Persia, 1929-1932, 1944, 1946 and 1947. Political (External) Dept. Collection, India Office Records, British Library. Report on Personalities in Persia, 1938 [E 2799/670/34]. Political (External) Dept. Collection, India Office Records, British Library. Donald N. Wilber. Reza Pahlavi: The Resurrection and Reconstruction of Iran. Exposition Press, Hicksville, New York, 1975.